How Do You Know When It's Time To Re-brand? As a creative entrepreneur, when you feel stuck in a rut or bored with your business, what's the FIRST thing you immediately want to do to get excited about your biz again? I think it’s only natural that we want to update “our look” as our business evolves, just like it’s only natural that we want to evolve our sense of style as we get older. Yes, ushering your brand into the present is a good thing. However, there are times when I see entrepreneurs or bloggers or business owners completely overhauling the look of their brand or website every six months to a year, and I think that could be a big mistake. TIME is a crucial part of the magic. Seeing brand elements used consistently over time is when they start to have staying power in the minds of your audience. The more time that goes by, the more your audience feels like they know you. They’re comfortable with you. They get you. If you switch things up too much on them, while it may serve you well in the short-term by giving you a boost in attention to your business, beyond that buzz is just a community that has to get to know you all over again. So, all that said, here are my quick rules for knowing WHEN a brand or website re-design is a good move. 1. Update your website if the primary objective of your website has changed. If you don't have a primary objective for your website... you should! It helps to know what you're trying to accomplish because that will inform the layout and design for your site. For example, about eight months in to Made Vibrant, I wanted to get serious about taking on more client work, and so the primary objective for my site was to create more inbound design leads. That's it. I made that the focus on the home page and called out my services throughout various parts of the site, not to mention the fact that I consolidated my three separate Wordpress sites into one Squarespace site so that all of my blog traffic would flow directly to my design services. Eight months after that, my primary objective changed again. Made Vibrant evolved from a client service business into a products & resources business. That's a pretty big shift in both audience and message, so I had to update my site to reflect that new objective. But, two website re-designs in less than two years can feel like a lot for the exact reasons I mentioned above. That's why I deliberately left parts of my brand in tact during those transitions. The logo, the keystone pattern, and the overall vibrant tone of the brand remained consistent, keeping things familiar and comfortable. That helped usher my community through the process of those various website re-designs/brand updates. 2. Update your brand if you feel it no longer accurately reflects the personality of you or your business. I am not just an advocate for unique branding; I'm an advocate for authentic branding. I believe your website and brand is your opportunity to communicate who you are and what you're about to your audience. It's your chance to attract the right kind of people, people that see you and your business for who they really are. That's why it's so important that the design reflects your true sense of self. Let's say you're a photographer who has been shooting weddings for the past five years and your brand has been all romance and fairytales, but now you feel like maybe if you look at another dang piece of white cake you might just SCREAM... well then, yeah, in that case it's time to move on from romance and fairytales. That's not your vibe anymore, it isn't coming from a sincere place, and so that's your cue that it's the right time for an update. 3. Update your brand/site if you feel your current look and feel is affecting your confidence. But what I don’t think gets talked about nearly enough is the other, less obvious reason for having a quality brand: that it makes you feel good. Now, I don’t mean to make it overly simple. It’s just that in business, confidence is so important. Being able to tell someone what you do, what you believe in, and who you want to help with conviction is the key to getting someone on board with your mission. And if you don’t have a brand or a website that you’re proud of, you may not feel so compelled to share your business with the world. If you feel like your current website or brand is preventing you from projecting confidence in your mission or business, then by all means throw every other rule out the window and invest the time to change it. BONUS RULE: Being bored with your branding is not a good enough reason to change it. If you're changing your branding or website, either you're a) a designer, in which case you're investing a lot of time and energy or b) you're hiring someone, in which case you're investing time, energy AND money. You owe it to yourself and your business to make sure those investments are worth it. Feel like your vibe doesn't suit your tastes or reflect your true self anymore? By all means, change something. Want to update your typography or add some fun graphic elements that reflect a new skill (eh hem, hand-lettering…), okay awesome! Go right ahead! BUT, please, please do not just overhaul the thing because you’re bored. Spend that time and energy on reaching your business goals and give your brand the time it needs to start working for you. Think about which of the above three rules applies to you and your creative business. Is it time to rethink the objective of your website or update your brand? Do you feel confident in your branding and what it's communicating to your audience? Do a little audit and ask yourself why you do or don't feel the need to give things a facelift right now. 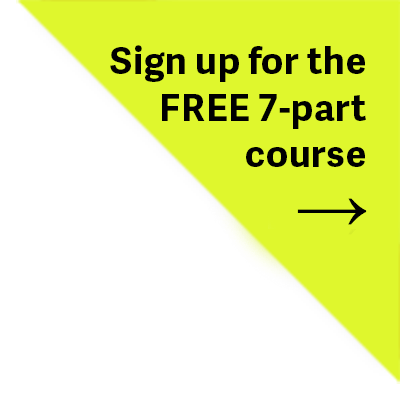 And, of course, if you ARE feeling justified in the need for a brand refresh and need a resource to walk you through it, consider joining us in the course. Here's your TL,DR quick reference guide. Pin it for easy reference in the future! Figure out who you want to reach and what you want to say in less than 7days. Brand clarity awaits! Submit + Get Your First Lesson! Let me start off by saying, I'm not naive enough to think that there is a single blueprint or one-size-fits-all secret to building a business. However, I do remember what it was like sitting at square one a few years ago, knowing that I wanted to start my own business, and wondering to myself day after day, "Okay, NOW what?" Especially when you see other online businesses you admire and they're off to the races doing ALL THE THINGS. They've got an active blog, an engaged Instagram audience, multiple product offerings or clients coming out of their ears, super professional "on-boarding processes" and "bookkeeping services" -- all the bells and whistles. When you see all that, it can be tempting to want to follow suit. It can be tempting to chase ALL THE THINGS because you want to feel like a legitimate business and (duh) you want to be making money. BUT here’s the problem with doing all the things: If you don’t find focus, especially in the beginning, it’s going to feel a lot like you’re trying to fill up about 20 buckets at one time. A little time and attention to social media, a little to your website bucket, your branding bucket, your audience bucket, your email list bucket... and suddenly you're filling up all those buckets at a snail's pace and not really seeing substantial growth in any one area. What sounds more efficient to you? Trying to fill up 20 buckets one drop at a time, or filling up one bucket at a time before moving on to the next? Exactly. That's why in the early days I chose ONE thing to focus on at a time so that I wouldn't get burnt out concerning myself with 20 different aspects of my business. I also discovered that in business, ORDER matters. Often, one aspect of your business is dependent upon another, so I sat down and thought about what a successful online business would look like to me. Then, I simply worked my way backwards asking myself "If I want X then what Y needs to happen first?" Each thing that I focused on would form a foundation for the next so that with every major growth period, I was setting myself up for success down the road. There are an infinite number of variables that contribute to the success or failure of a business. However, I do think that there is value in learning from those that have gone before in order to create a toolbox of ideas for you to implement in the building of your own business. And that's what I’m aiming to provide with this post. Not to give you a recipe for success, but to give you MY recipe for success in the hopes that you can pull out a few ingredients to use for yourself. All that said, let’s assume you too are at square one right now. You have a general idea of the kind of business you want to create, but you have no products, no clients, no revenue, no audience. Here are the 5 crucial steps I would tackle (and the order I would tackle them in) to get you making some sustainable revenue. 1. Get clear on your WHY. Hint: it's probably not the first thing you think of. Your WHY shouldn't focus on your services or products; it should center more around your beliefs and your mission in the world. Let's say you're a wedding photographer. "To provide quality photography services to brides" isn't going to connect with anyone. So ask again. "Because I believe that memories are one of the most valuable things we carry with us in life. The more valuable memories I can preserve for people, the richer their lives become." If you can figure out the answer to that question -- something that will connect with people on a deeper, emotional level -- then you'll equip yourself with the tools you need to cultivate the right audience for your business. Your WHY will serve as a magnet for people that come across your brand, attracting your ideal audience and repelling those that don't resonate with your mission. And THAT is what you’re aiming for. Investing the time to get clear on what you believe in, what you’re about and what you stand for will also help you establish guiding principles -- a compass, if you will -- which will help guide you as you make decisions in your business. But how do you figure out your WHY? If you’re planning to keep your online business a solo venture, dive into your past and ask yourself what were the pivotal moments that led you to start this business or that contributed to your beliefs. In the Better Branding Course I lead students through an exercise called “Owning Your Origin Story” which is all about looking at your life as if it were a book with chapters. What were the pivotal “plot points” that moved you from one chapter to the next? Your WHY is probably hidden in these pivotal moments and getting crystal clear on those more important facets of your brand will act as your foundation. Whatever changes you might make in the future to evolve your business model, your offerings, your target audience, etc., your WHY will likely not change that drastically, so it's a great place to start. To give you an example, Made Vibrant’s WHY has stayed the same since I opened its doors in January of 2014. Made Vibrant aims to help people live as their best, brightest, most vibrant selves. I believe that when people show up as the fullest expression of who they are, the world is a better place. I’ve executed that mission through brand design and client work, as well as through my writing and my learning resources. So many aspects of my business have evolved over time, but that WHY has and will remain my compass. That's because I took the time to ask those hard questions in the beginning, and I infused my mission into every aspect of my business as I moved forward. 2. Create the best, first version of a brand identity and website. Now, once you have your WHY, it's time to craft it into some sort of visual identity that can quickly and powerfully communicate your message in the digital world. The truth is, a well-designed website gives you credibility as well as a digital address. It allows people the opportunity to find you and to know more of what you’re about. But, this is where a lot of people get stuck. Building a website or a brand can seem really overwhelming if you’re not tech savvy or trained in design. But, it doesn’t have to be! Start by creating a simple and versatile logo. You don’t even have to use Photoshop (just check out my post showing you how), but you do have to have an idea about what kind of tone you want to convey in your brand. In fact, this is the very reason I created the Better Branding Course -- to help entrepreneurs who are just starting out that want a professional-looking presence at an affordable price. So many people let this one step in the process hold them back because they want it to be PERFECT right out of the gate. Spoiler alert: it won't be perfect. In fact, if you want to see the origins of Made Vibrant, just check out the imperfect evolution of my own brand design. The point is, you have to start somewhere. Use tools that will set you up for success (like Squarespace, whose templates are modern and responsive right out of the box.) Ask for help when you need it. But just get something out there because until you have some kind of digital home, it's going to be hard to establish legitimacy with any kind of audience. When I started Made Vibrant, I knew that whether it was selling branding packages, hand-lettered prints, OR teaching products, I was going to eventually need somebody to sell TO. Getting specific about your audience helps you figure out the pain points and challenges of one single like-minded group. If you’re trying to reach everyone, it’s going to be hard to pin-point what exactly they struggle with and how they interact with your products or services. However, if you narrow your focus to a smaller, more concentrated segment of people, some of their challenges and struggles will start to get more similar. This will allow you to get highly specific with your messaging, speaking straight to that group of people. Narrowing your audience also helps you tailor your offerings to a well-defined need. Made Vibrant specifically targets people I call soulful creatives. These are creative people with an interest in personal growth, learning, and self-made success. Because I defined this audience very clearly up front, I’ve been able to hone in on the unique desires, goals and needs of this audience. Is this an audience I want to be working with? Is this a group of people that want (or better yet, need) what I’m offering? Is this an audience I’m uniquely equipped to help? Once you have this group of people identified and clearly understand who they are in your head, you can decide what information is valuable to them and how to deliver that value. There are some differences of opinions as to whether a blog or newsletter is better to focus on, but I’ll go with what has worked for me. I believe in the power of email. It’s captive and it allows you to create a lasting, more personal relationship with people in your community. Within the first month of my business, I started a weekly Monday morning email newsletter, recognizing that my soulful creatives would appreciate a boost of inspiration or motivation to begin their week. It was slow to start (my first one I sent to just 2 people!) but over time it has grown to over 5,000 people. I've sent a weekly email for over 100 straight weeks. Delivering value consistently not only tells my audience that they can trust me (I'm reliable in the value I deliver), but it also tells them that I care about helping them. That way, when I do offer a paid product, they are more inclined to buy because they trust me and feel I've already delivered a ton of free value. I cannot emphasize the value of consistency enough. If you want people to trust you with their dollars, you have to prove to them that you're worth it. That you can follow through. The key with this audience step is TIME. Building a community will take time, but it is absolutely crucial for setting yourself up for success down the road. You can create the most valuable product or service in the world, but if you don't have the right audience to share it with, your revenue opportunities are going to be limited. As a bonus, I use my email newsletter to communicate directly with my community and ask what they want, what they are excited to learn about. This information in turn informs my product development, which ensures that my products already have demand. It's a beautiful cycle! I know you were hoping that all five of these steps would be relatively painless, but here's the truth of it: there's no shortcut to doing the work. You can build a solid audience around your WHY, you can deliver value to them consistently, but if they don't trust that you know what you're talking about, they won't buy. If you're a designer, make your portfolio easy to find and share your work. If you're a photographer, take a ton of photos. If you're a coach, help people and actually have some results to share. If you're a maker, make things and get them out there! This is usually when those that are just starting out say, "But if I need clients to get clients, where do I start?" Take on free work if you have to. Make sure you're not spending more time on it than you should, but help a few people at a super reduced rate or for free just so that you have some testimonials and work to show. Not only will these clients/projects give you credibility with your audience, the experience will also give you a ton of content to write about and share with your community. 5. Create a quality product or service that your audience wants and sell it, baby. Hopefully you've already started making some money in your attempt to work towards #4, but if you're interested in selling products or offerings that will bring you recurring income (e-books, courses, coaching, etc.) then by this point you have all the ingredients you need for a successful launch: You have a strong emotional foundation to your brand, a website for people to find you, an audience to sell to, and the experience to pour into a quality product. The same "bucket theory" applies to developing your products, though. You don't want to release 12 at once without understanding things like the price sensitivity of your audience, what kind of launch sequence works best for you, etc. Start with one product or offering and get that to a place where it's streamlined and running smoothly. If you can come up with a launch formula that works well for your audience, there's no harm in replicating it for future products or offerings. I will say this though: if you're a service-based business, consider testing the waters with a digital product, something that you can invest time in up front and that can help you make revenue from that point forward. I'm a BIG fan of revenue diversification. By diversifying your revenue streams, you can create a more stable, sustainable business because no longer will you feel the pinch if you have a slow month and no clients coming through the door. The same works vice versa. If you exclusively sell products, make sure you have a service-based offering that you could send out to your audience if a launch didn't go as planned or if one of your products stops bringing in substantial revenue. As you continue to develop your products, it's a good idea to revisit each of these steps and view these 5 phases as a cycle. Re-evaluate your WHY and make sure it still rings true for you. One year later do you still feel your website accurately communicates to your audience? Does it show the breadth of your work? These are the questions you want to continue to ask yourself. Running a profitable online business isn't easy, but I believe that these five basic steps will provide you with a rough outline of how to move forward and build your dream business, as long as you trust your gut and build it in a way that is aligned with who you are as a person. Wishing you the best of luck, and can't wait to see what you create! Sometimes when you’re starting out, it can be tempting to declare that your business is for everyone! When I started my freelance design studio, technically I could design for any type of business, from a corporate giant to a solo entrepreneur. It was just a matter of applying the same principles to a different set of problems and scenarios. BUT, as I quickly found out, those two types of audiences have very different challenges, pain points, budgets, etc. That’s exactly why choosing a type of person or business to target is so important. It’s about giving yourself the best possible chance for resonance. And resonance means true fans, lasting customers, or repeat clients. Now, let’s talk about why that is. First, getting specific about your audience helps you figure out the pain points and challenges of one single like-minded group. If you’re trying to reach everyone, it’s going to be hard to pin-point what exactly they struggle with and how they interact with your products or services. However, if you narrow your focus to a smaller, more concentrated segment of people, some of their challenges and struggles will start to get more similar. This will allow you to get highly specific with your messaging, making it appear that you’re speaking straight to that group of people. Narrowing your audience also helps you tailor your offerings to a well-defined need. Take the Better Branding Course, for example. My brand Made Vibrant's ideal audience is a group that I've dubbed "soulful creatives." These are highly creative people with an interest in personal growth, continuous learning and self-made success. Over the years, I’ve been able to hone in on the unique desires, goals and needs of this audience -- one of those needs being an affordable and encouraging option for branding. Because I was able to connect with that audience, I could tailor my course specifically to the needs of those people. Lastly, by getting specific when it comes to your audience, it will allow you to attract valuable members of your tribe and repel more transient members of your tribe. "I want to attract you or I want to repel you." Okay, the attract part made sense to me. Of course you want to attract new blog readers, new clients, new people in your community. But REPEL? That's such a strong word! It seemed so counterintuitive at the time. Until she pointed out to me that repelling the wrong people (people who won't appreciate your business or people whose values don't line up with the values of your business) actually saves you valuable time and energy down the road. It's not just a matter of authenticity -- it's a matter of efficiency! Turning away customers or clients that aren’t a good fit for your business is almost as important as attracting the right ones because you don’t want to be wasting your resources on people who won’t positively impact the health and growth of your company. By drawing a line in the sand on who “your people” are, you’re effectively keeping your tribe as high-quality and engaged as possible. Depending on where you are with your business, you may already have a pretty clear sense of who your ideal audience member is. 1. Is this an audience that I want to be working with? There’s a reason why I refer to it as an "ideal audience." You have a chance to choose the people you want to serve, and if you choose a person you don’t want to be working with, you’re setting yourself up to not be very happy with your business. Think hard about who it is that you actually want to help. If you get stuck, sometimes it helps to start by who you definitely do NOT want to be working with. 2. Is this a group of people that want (or better yet, need) what I'm offering? If you’re trying to sell jetpack rollerblades to grandparents, you might run into a few issues. It’s important to identify whether the audience you want to help is actually in need of your services/offerings. This will make sure that the business you’re creating a brand for actually has the ability to be profitable and sustainable long-term. 3. Is this an audience I’m uniquely equipped to help? It helps if you are especially well-qualified for one reason or another to connect with the audience you choose. In my case, I believe I’m uniquely equipped to teach soulful creatives because I myself am self-taught. That gives me insight into what someone might be thinking who is always trying to learn new things and get better through continuous learning. I can't tell you how much I recommend spending time solely focused on this one aspect of your business because your audience is the life force of your company. They are the ones that will buy your products or services, and they are the ones you want to keep happy and deliver value to! Need some help defining your audience? This is a topic I cover in the Believe Your Brand Challenge -- sign up below to get your first free lesson today! It’s the great dilemma of many a “multi-passionate” creative, as I've heard Marie Forleo refer to them. But it’s no surprise, is it? With creativity often comes curiosity, exploration, excitement, passion, inspiration -- all of these great things that can lead us to a multitude of exciting disciplines across many different crafts, industries and career paths. For example, I’m an artist and a designer, sure, but I’m also a writer, a hand-letterer, a teacher, a business strategist, etc. One creative discipline often bleeds into the next, and so we're left with this motley crew of somewhat-related, somewhat-UNrelated ideas and passions. As a business owner, you often hear that you need to focus. You need to pick one specific niche that you can totally own. And I don’t necessarily think that’s bad advice. In some cases, I've actually seen that advice really pay off. BUT, I have to admit that for the multi-passionate creative (especially who's just starting out), this advice can feel a bit limiting and at times down-right paralyzing. So, what’s my solution then? How do you choose what to focus your brand around when you have a ton of different interests? I know what you’re thinking though: How in the world am I going to communicate what I do effectively if I don't pick one thing to focus on? Well, instead of trying to choose one passion to focus on, instead try choosing one underlying theme to focus on. Branding doesn’t have to pigeon-hole you. In fact, it can actually be a very effective tool to provide you with the space and leeway you need to explore your interests and evolve over time. By building your brand around YOU. I talk to creative solopreneurs all the time and they’re searching for this one connective thread that’s going to conceptually weave all their interests together into one neat little package. They spend countless hours wondering HOW do I explain to people how teaching music lessons and painting with watercolors actually make sense together. They look for this connective thread in the right brand name or a clever tagline and they usually end up frustrated in their pursuit. Why? Because they're looking for the answer outside when they should be looking inside. The connective thread is YOU. YOU are the one who is passionate about these different interests. SO passionate, mind you, that you’re not willing to sacrifice any of them to focus your brand on just one. What is it IN YOU that finds each of these things interesting? What single quality or desire or belief IN YOU relates to all those things? In other words, what is the human common denominator. Just like the random example I listed above, let's say you’re a musician and an artist. You teach music lessons but you also do watercolor paintings and you’re wondering how those two things fit together under one brand? Do I make my brand about music or art?, you’re wondering. The answer is neither. Because your business isn’t ACTUALLY about music or art. Those things are merely instruments you use to give something much deeper to the world. Maybe you love both because they allow you to turn the intangible emotions inside you into tangible things that can be shared with others. Maybe you love the freedom that comes with improvising in music and the unpredictability of watercolors. Uncovering those deeper insights in YOU -- the connective thread -- will allow to create your brand around a common theme, not just one interest. Maybe your brand is about expressing emotions or about the unpredictability of creating. In the case of Made Vibrant, I had absolutely NO idea what I wanted my business to evolve into when it started. I knew I wanted to do freelance design, but would I also have a stationery line? Do commissioned art? Write a book? I had no idea. One thing I knew for sure was that I didn’t want to change the name or branding of my business every three months as I experimented with the direction of my business. I knew I had to create something that was flexible. What is the connection between all of the things that I love? What really moves me about the work that I do? If I had to boil down all the things that light me up into one single deep underlying purpose, what would it be? And that’s how Made Vibrant came to me. To put it simply, I love the fullest expression of things. Nothing makes me happier than seeing the potential of something fully realized, fully expressed. And my business and brand are based on that foundation. Whether it’s helping someone create branding that fully expresses their vision or whether I’m writing about trying to be the fullest expression of myself -- it’s all about the same thing deep down. It's about aligning reality with a vision. Living brightly and confidently. Creating art that radiates. Suddenly, just like I mentioned above, my brand no longer limits me; it actually inspires me because I can start to see my own mission everywhere. If you're a creative with a multitude of passions, I encourage you to stop focusing on the WHAT and start focusing on the WHY. Keep challenging yourself to go deeper and you will find the thread that you're looking for because the thread exists in YOU. The thread exists in YOU. One of the biggest struggles I hear from people who want to start creative businesses is that they feel beyond overwhelmed by the idea of creating professional, high-quality branding on a shoestring budget. And believe me, I get that. If you're starting a business, you want to feel proud of what you're putting out into the world. But when you're not trained in Photoshop or you have no experience in design, it can feel like this huge, daunting roadblock to your forward progress. It's my mission to make branding less intimidating and more accessible to people of all design backgrounds and skill levels. That’s why I set out to uncover some FREE tools that would allow someone to create a logo that looks and feels professional -- one you would be proud to put on version 1.0 of your website or business card. So… today I’m going to show you my step-by-step process for creating a website-ready logo using Google Drawings, not Photoshop. But first, let's go over some basic rules about logo design. As a designer, I can tell you there's a LOT more that goes into effective logo design than people think. There's concept development, thumbnail sketches, color theory, typography , balance and spacing and variations... the list of things to consider goes on and on. BUT, right now, I want you to forget ALL of it. Overcomplicating things will only lead to self-doubt and more waiting, and the world NEEDS your gifts so we're not going to focus on all that. There's a time and place for all that design thinking, sure, and maybe when you've got your business off the ground and you're swimming in gold like Scrooge McDuck you'll invest in a quality logo. BUT for right now, your #1 goal should be to launch your idea to the world in the best, FIRST version you can. And that's what these basic rules should cover. 1. Avoid using more than two typefaces when creating a logo. This is a pretty standard rule-of-thumb for logo design. You don't want your logo to be distracting or feel disjointed, so by keeping yourself limited to two, well-balanced typefaces, you can ensure your logo remains effective and versatile. For some further reading on typography and pairing typefaces, I love this post on Go Live HQ. 2. Err on the side of simple and legible, not clever and stylistic. I get it. It can be tempting to create some super-meta, highly conceptual logomark. Maybe you're a knitter who uses eco-friendly threads so you want a leaf with a needle through it and a circle to symbolize the cyclical nature of our relationship to earth. All of that is wonderful. BUT if it's not executed properly, it could leave your audience feeling a bit bewildered. The purpose of a logo is to be identifiable and to support the memory of your brand identity in the minds of people. The safest bet in that case is to make sure your design is legible, easy to understand, and not overly complicated. I've evolved my products and services several times, re-designed my website three times, updated my branding once, and you know the ONE THING that has remained constant? My logo. The one I designed in 10 minutes when I scrambled to get my website up three years ago. Why? Because it was simple and flexible enough to move with me as I evolved. And it continues to serve me well. 3. Be honest with yourself about creating a logo. The key here is this: don't try to be someone you're not when it comes to your design skills. Does pairing colors or picking out fonts make you break out in hives a little bit? OR, do you have the opposite problem? Do you get lost down the rabbit hole of DIY design because you don't know when to simply DECIDE and move on? Either way, it's okay! Whatever you think your weaknesses are, understand those going into the design process and plan accordingly. If design scares you, give yourself permission to keep it simple. And if you typically get lost in the proverbial design forest? Give yourself a time limit and then make the commitment to decide and move forward. Remember, nothing is permanent and your job is just to create something you're comfortable with and can be proud to promote when launching your business! Now let's dig in to how you can use Google's free tools to create your logo without Photoshop. Step 1: Using Google Drawings, start a new document to create a logo. You may not have even known that this tool existed, but it's been hiding in your Google Drive! All you need to access it is a Gmail account or Google Drive account. Step 2: Name your document & adjust size (if necessary). The first thing I always do when I create a new document is rename it. The last thing you want is a bunch of "Untitled drawings" floating around your Google Drive. I also take a second to choose File > Page Setup... to make sure my document is big enough. If you select the dropdown in the Page Setup popup, you can navigate to "Custom" which will allow you to set your document size in inches or pixels, whichever you prefer. I recommend pixels since you'll probably be creating this logo for your website. The default tends to be set at 960x720 pixels, which is plenty big for what we need. The bigger the canvas size, the less chance of losing resolution (crispness) if you go to drop it into your website later on, so I recommend starting with something close to 1000 pixels (1000px). Step 3: Start your logo design by adding a text box with your business name and picking out your typefaces. I'm not going to get too much into how to choose typefaces for your logo, though I do go into it at length in the Better Branding Course, but you want to select a typeface that matches the personality of your brand. As an example, let's pretend I'm launching my wedding photography business under my name "Caroline Kelso." I want my brand to feel elegant and slightly feminine, but with a modern edge. First, use the Text Box tool to drag your text box across the canvas (you want it to stretch as far across your canvas as possible.) Then, type your brand name in the text box. After highlighting your text, navigate through the Google Font options in the formatting toolbar to find something that fits the tone your going for. In my case, "Unna" is a serif font (meaning it has the bars across the letter forms) which makes it feel a bit traditional and classic, but the square shape of the letters and the sleek, straight feel of the serifs give it a more modern edge. Now this is a great opportunity to add an additional identifier to your logo. In the case of my example, if I'm launching a photography business and that's not abundantly clear from my name, I'll want some way for people to immediately understand what I do. This is when you'll want to add an additional text box in a complementary font. I chose a thinner san-serif font (without bars) to balance out my main font. Also, remember to create hierarchy in your design. You want to help people understand which is the more important part to read first (your brand name) followed by the more secondary information (your identifier.) To establish hierarchy, I made my identifier smaller in size and a thinner font. First I highlighted my text, and changed the font the "Muli" using the font drop-down. Now, I admit that your text formatting options are more limited than a design program here, but that's when you get creative! Try typing your text in all caps (see above) or try using an italic font to create visual interest. Then be sure to center and adjust the size so that it feels in balance with your primary brand name. If you have more than one text element at this point, be sure to select both text boxes and use the alignment tools to make sure they're centered with one another and that the spacing between them is just the way you want it. Step 5: Add your brand colors to your logo. Highlight your text and use the text color tool to change the color if you want. Use one of the colors in the drop down, OR select "Custom" to use your own unique hex code. In my case, let's say I used a tool like Coolors.co to find the hex code of a color I want to be my primary brand color. I simply paste it in the color picker to modify the color of my text. Step 7: Crop your canvas and save as a transparent png file to create a logo. Now that you have your brand new logo, you'll want to crop down your canvas size so that if you upload the file onto your website, there won't be extraneous space around the edges. The simple way to do this is to grab the bottom right-hand corner of your document and drag up until you have about the same space all the way around your design. Once your logo is the proper size and crop, select File > Download As... > PNG image. This will export a .png file with the transparent background in tact, allowing you to easily upload it to Wordpress, Squarespace or whatever website platform you're using. Tip: If for some reason your canvas background is not the checkerboard transparent background you see above, right click anywhere outside your document (in the gray area) and select Background > Transparent. You also have the option to export your logo as a vector file by using File > Download As... > Scalable Vector Graphics (.svg). This will create a file that could be scaled up or down without fear of losing resolution. You could use this to print your new logo on a large banner for an event OR you could give it to a designer to edit in a vector program like Adobe Illustrator. Pretty cool! Step 8: Use the logo you created without Photoshop on your website! Finally, you get to see this new puppy in action! I made a fake Squarespace site with my new photography logo, but all I had to do was upload my .png file that I downloaded in Step 7. Good to go! A few style tweaks of one of their templates and I'm ready to launch a professional, quality brand! Optional Step: Add brand icon or graphic elements to your logo. Now, if you're a beginner, just stop reading here! No need to complicate your beautiful type-only logo with unnecessary elements. However... if you're itching to pump up the volume and curious what other design features are available to you in Google Drawings, here are some options I've played around with to create a logo with icon or graphic elements. Add geometric shapes as graphic elements for more pizzazz. Tiny colorful circles become... confetti! A dotted line plus some random shapes using the "Polyline" selector under the Lines drop-down adds fun and visual interest. Drop the transparency on the color fill bucket of the shapes for added fun. White text on a color-filled rectangle can be understated and sophisticated yet professional. Ready for even more of a challenge? Use an icon resource like The Noun Project to find an icon (this one with a Public Domain license so it's free to use) and use it as a template to draw your own illustration using the Polyline tool. In this case, the lines were too thick for my taste so I drew my own and put it on top of a Pentagon shape using the "Shapes" dropdown. Or... one of my personal favorites, use the "Scribble" tool to create the illusion you've colored in your illustration. Start with an icon from The Noun Project like I mentioned before (this one created by Alex Berkowitz.) Choose "Scribble" from the Line dropdown and drag your cursor over the illustration. Then, change your line width to something thicker like 8px. Change the color of your line to the color you want your scribble to be. Finally, use the Arrange > Order > Send to Back option to put the scribble beneath the illustration outline. Now you have a "color outside the lines" brand icon! These are just a handful of ways you can create a logo without using Photoshop and using Google Drawing's free tool! Don't let your fear of Photoshop hold you back from creating a professional logo that you're proud of!